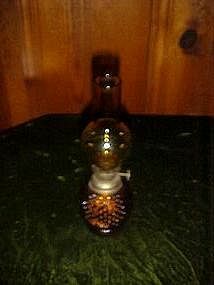 Small dark amber kerosene lamp in the hobnail pattern with hand blown amber globe, and original wick. Mint condition and has never been lit. Measures 8 1/2" tall. Made in Hong Kong. Not a good photo, it is a very nice lamp.